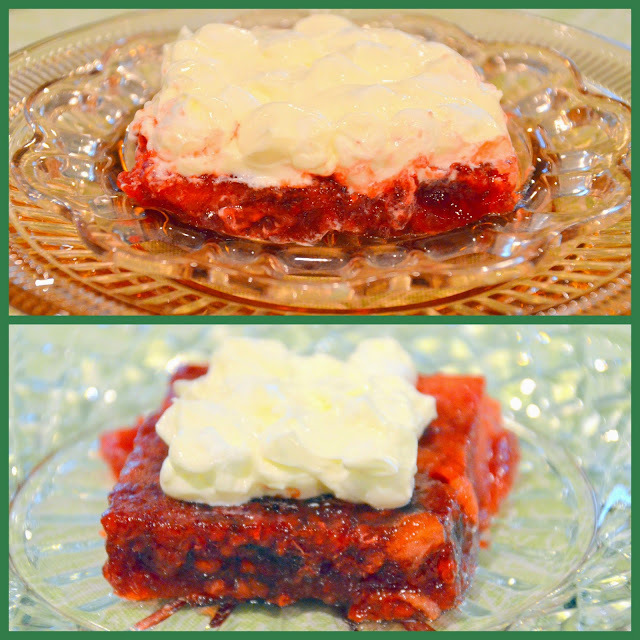 For Flashback Friday I re-visited my Applesauce Raspberry Jello that was first published in 2009. I added a few options in presentation this time around including the parfait version above.You can use a parfait presentation or a simple square pan presentation to enjoy this easy dessert or side salad dish. Dissolve Jello in hot water. Add frozen raspberries and blend carefully. Add applesauce. Pour into 9-inch square pan. Chill until set. 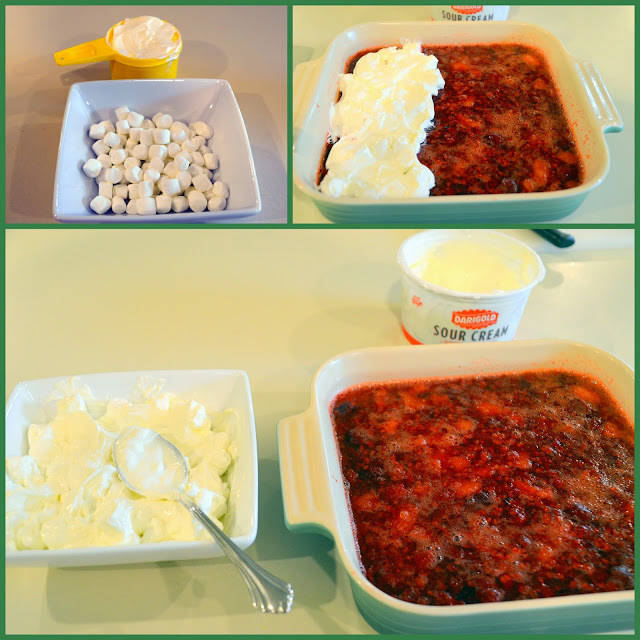 Combine sour cream and marshmallows and spread over top of set Jello. Cover and Chill. Serves 6-8. If you want to present this dish in an individual parfait glass do not spread the sour cream mixture on top of the set jello. Keep it separate and layer the ingredients. I have doubled this recipe and put it in a 9 x 13 pan. It's a refreshingly cool salad! If you aren't fond of marshmallows omit them and add a tablespoon or two of sugar to your sour cream. 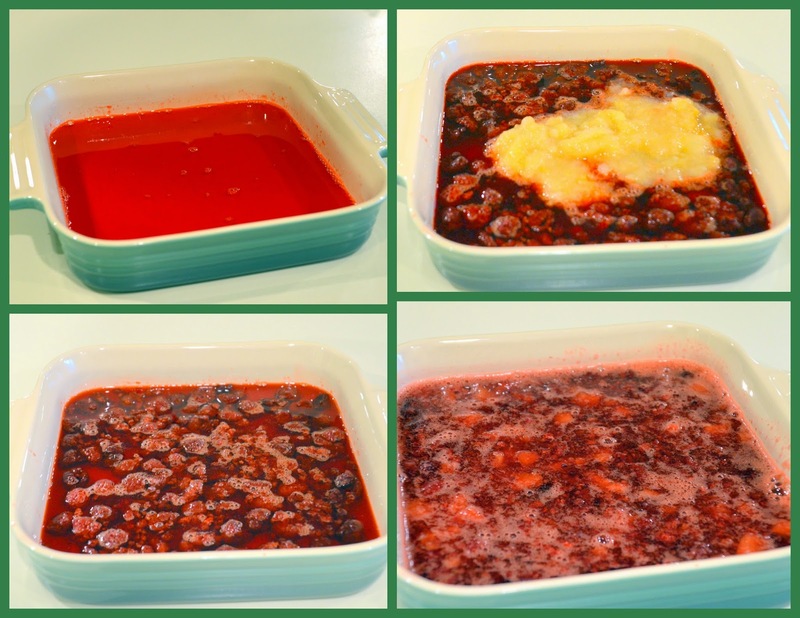 You can also just put a dollop of the sour cream mixture on top of the jello squares instead of spreading the topping completely over the jello. Ellen, I can imagine that the sour cream and marshmallows would make a great topping. .just a hint of sweetness. This would look really pretty in little parfait glasses. Raspberries are plenty around here in summer. . I'll try it then. Mmmm.... all my favorite ingredients and gluten-free -- wonderful !!! I think my grandkids would really like this! Why are they so far away? Yum...I know that sourcream combined with sweetness is definitely a good combo. I think my experiences with 'church basement potlucks' probably had a version or two of this in the 'spread'. Thanks for the recipe...brings back memories. Delicious looking salad..great to add to the Easter meal. I have never made this with applesauce... will have to do this. :) Yum. good ol' jello salads.....i loved them as a kid and i would love them now. i think i will have to try this.....it has been soooo long. Yum - I used to make something similar to this! Thanks for the reminder - it looks good.